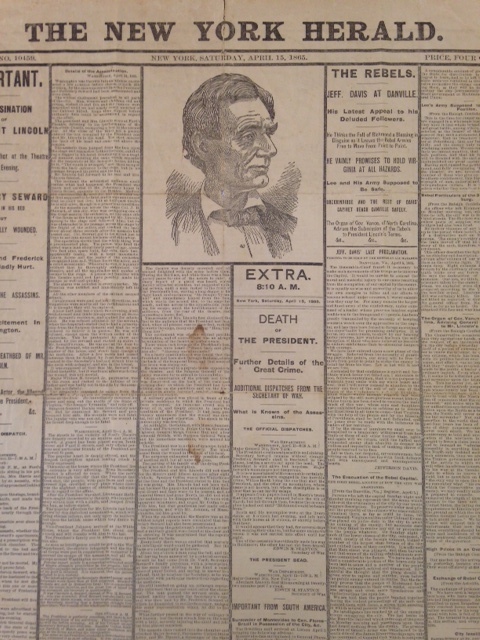 New York Herald, April 15, 1865. Bradford Family Collection. 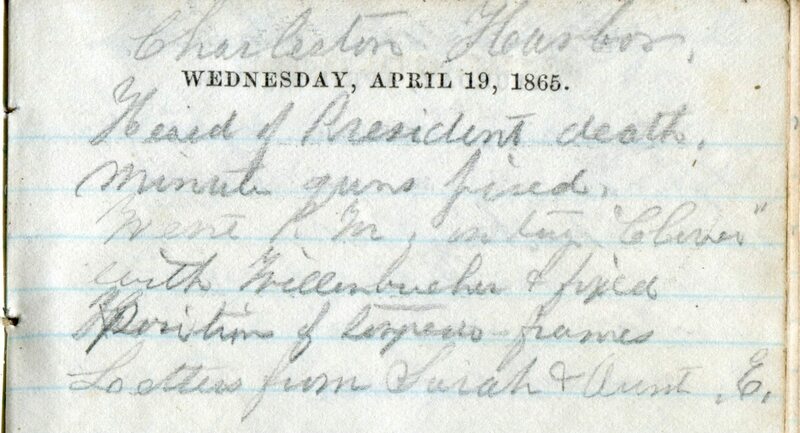 One hundred and fifty years ago today, April 15, 1865, many American’s awoke to the news that President Lincoln had been shot in Ford’s Theater the night before. In the Drew Archives’ collections we have a number of journals and letters that speak of this tragic event. Some written days after, when the news finally filtered to those far afield. Lincoln’s death was devastating to many Northerners, especially coming so close on the heels of the joyous celebrations following the surrender at Appomattox. Capt. 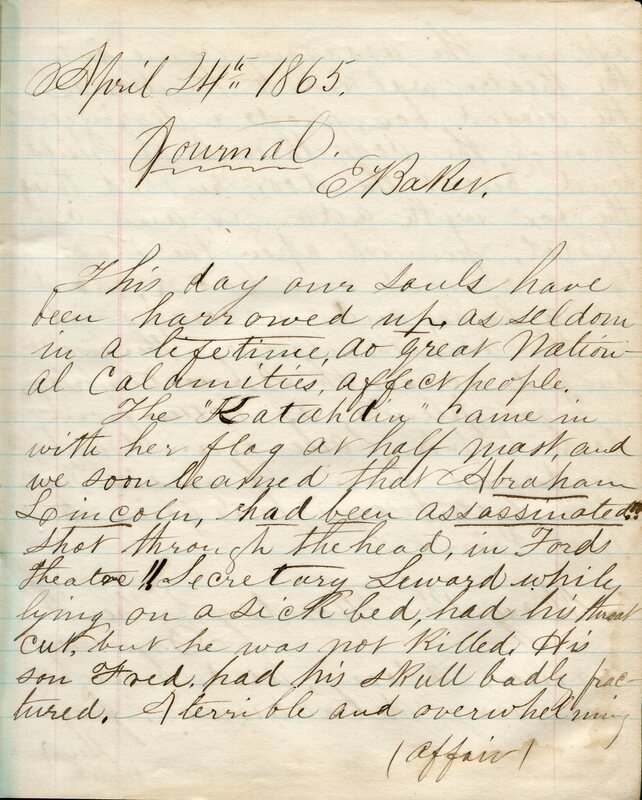 Edward Baker diary page, April 1865. Capt. Edward Baker Collection. “Sailed for Fortress Monroe where we arrived on the morning of the 17th. Carried down orders for every vessel to commence and fire a gun every half hour from sunrise to sunset, in honor of the president. Letter from John Southworth, Hall’s Hill, Virginia, Camp Barnes, January 7, 1864. On a late summer day in 1861, 17 year old John Southworth of Duxbury was mustered into the 18th Massachusetts Infantry, Company E. He was not alone, accompanying him were a number of young men from town, including his brother, 20 year old Walter. John and Walter, like many in Duxbury at the time, were shoemakers. The glory days of Duxbury’s shipbuilding era was a generation past and many took to making shoes, or cordwaining, as an occupation. John’s father, James, was alternately listed as a farmer or shoemaker in the US Census Records, indicating that the Southworths owned a sustainable farm in Duxbury but required the additional income shoemaking could provide. The Southworths belonged to a large network of families that had lived in Duxbury since its founding. When John marched off to war he left behind his parents, James and Lucy, as well as a number of siblings, aunts, uncles and cousins. One such relation was young Emma Cushing Paulding (b. 1843), the daughter of one of the last successful shipbuilders in town, William Paulding. 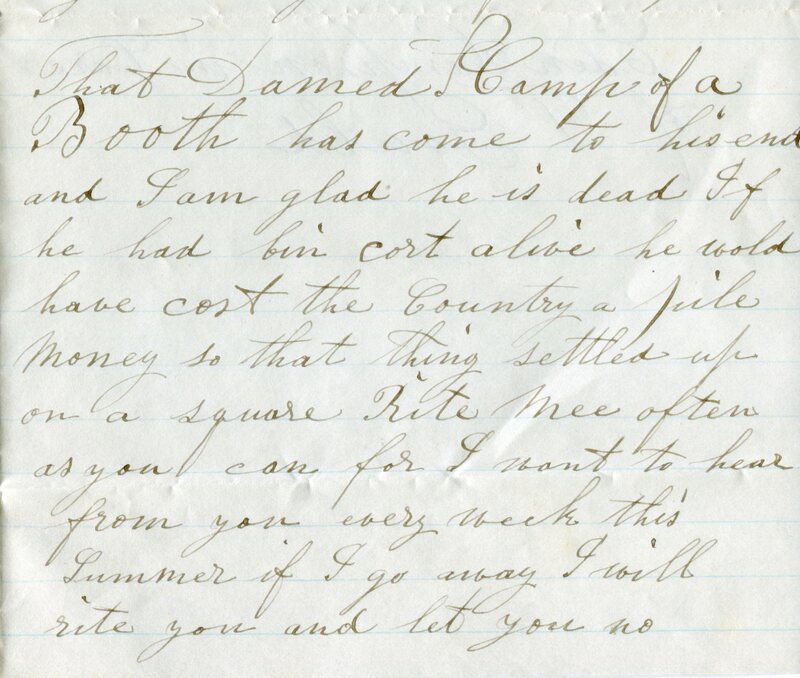 As first cousins living in a small town, Emma and John had grown up together and it is through their Civil War correspondence that we are able to glimpse the kind, wistful and serious-minded man John Southworth was. As a member of the 18th Massachusetts, John Southworth’s tenure was three years, during which he witnessed many of the most notable battles of the Civil War, including Gettysburg. His letters describe the cold, miserable conditions men on the picket lines had to endure, the long marches without any rest, and the fear of facing battle. In one letter he described the suicide of a fellow soldier who was so desolate he would rather die than face another day of war. John also writes of coming home and his wish to see his parents, to go on a sleigh ride and to attend dances once again. Through his letters it is obvious he and his cousin Emma shared a familiarity and friendship, and perhaps, although they were cousins, a bit of romance. Many of John’s correspondents had left off writing him and he was always grateful to receive word from Emma. Although John did not make it home, his brother Walter did, marrying a local girl named Emma Chandler and raising a family in Duxbury. As for Emma, a few years after the War, she married George Bartlett Bates of Kingston, MA and had five children. She died in 1930 at the age of 87. John Southworth alludes to a diary he kept as a soldier. We can only suppose it was lost while he was a prisoner. The six letters that Emma Paulding kept, however, allow us to know John Southworth and his experience, if only a bit. 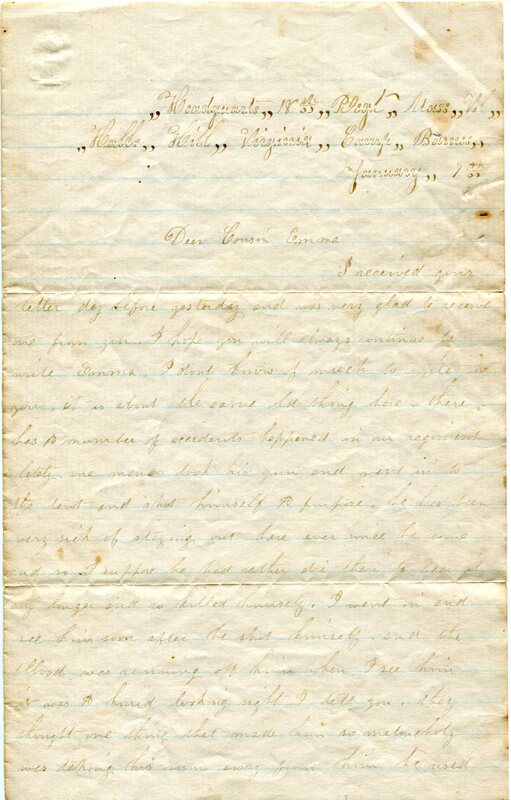 The letters were transcribed by Dylan Kornberg as part of his Duxbury High School internship program and are available by clicking the Emma C. Paulding Papers link to the right under Small Collections. Note: This blog post originally appeared on the Duxbury Rural and Historical Society’s Duxbury in the Civil War blog site (www.duxburyinthecivilwar.wordpress.com) in May 2011. In light of the Southworth letters being featured on the Library of Congress’ National Union Catalog of Manuscript Collection’s Documentary Heritage of the Civil War I thought I would repost it. This blog post originally appreared on the Duxbury Rural and Historical Society’s Duxbury in the Civil War blog. It is such a great letter, I thought I would share it here as well. We are again at Shooter’s Hill, we started from here a week ago at 4 o’clock in the afternoon and marched till 3 o’clock the next morning and then started at sunrise and marched till sunset where we camped overnight and took some prisoners. All the houses are empty and some of them we set on fire. If we get hungry we kill hens, ducks and cattle and pigs and every thing we want to eat. We started the next morning with the intentions of cutting off the retreat [of] a rebel regiment which started from Fairfax but we was 2 hours to late. They burnt bridges and cut down big trees to stop us all they could but we pushed on as far as Centerville. There was about 8 regiments in all that went with us but when we got to Centerville there was 20 or 30 other regiments encamped there. We stopped here two days then we started for Manassas where we fought an awfull battle. Men that have been in other battles say that it was the most murderous battle they ever saw for so short a time. It only lasted 6 hours. I haven’t heard how many men we had to take the place, some say there was 40,000 but there wasn’t one half took part in it. The battle twas either sold or it was a great blunder. They had over 100,000 men and had batteries in the woods and batteries that reached 1 ½ miles. They heard we were coming and was reinforced 30,000 the very day we got there. I will give you a little description of it but I suppose you will read about it in the papers. When we got within about 1 mile of the place we heard cannon and saw the smoke they then made us urn double quick to the field where we threw off every thing that encumbered us. The shells were flying every direction and the first man I saw killed was one of our own Company. A shell struck within six feet of us killing one and knocking down two or three more. A piece tore my pants a little and that was all. We was ordered on to the hill where I saw sights that was enough to make a man grow mad. There was men laying dead and wounded and the artillery men had been killed and the horses were all dead piled together by the Cannon. The bullets were flying thick. The enemy wasn’t more than a stones throw from us. The glorious eleventh gave one fire and fell back leaving behind them many dead and wounded. A ball struck my gun but that was nothing. We loaded again but that was the last fire we gave together for the other regiments that went up after us got cut to pieces so they broke, breaking us and everything was confusion. Some of our captains got killed. Then there was so much noise we could not hear our Colonels and every man was for himself. I went again on the hill and fired but the bullets and grape fell so thick we fell back again leaving hundreds behind. Besides a lot of Ellsworth Zouves lost 3 or 400 of their men. I went down into the woods with about 100 others where we could fire into them without their seeing us and here I came the nearest to getting killed. There was some of us went deep into the woods. I saw a company of men in there and thought they were our men but when they see us they fired into us and the way the leaves and splinters flew off o the trees it made me think of home. I rushed out of the woods and our Cavelry were coming down the hill to charge into them but they had hardly got into the woods when I should think a whole regiment fired upon them. They turned their horses and fled and there was as many as 30 horses came out without a rider. I jumped into a little hole to keep clear of the bullets and there was 4 or 5 soldiers in there. I asked them some questions but I found they was all dead. Every one was leaving for the hill. I went up there where I shot about a dozen shots when I see they was retreating. I was one of the very last ones. When our Cavelry rode by us on the gallop told us to run for some woods ahead as quick as we could for their Cavelry was coming. I looked back and saw the dust and only saw about 20 behind me when I threw away my grub bag and gun and run for life if I ever did. They did not follow but a little ways and went back. I picked up another gun that was loaded and discharged it at them. Every body was going towards Centreville on a run. There was men wounded on the way crying for help but every man seemed to look out for himself. All the houses and barns were filled with the wounded but we had to leave them and I suppose they were all killed. There was 12 of our company missing this morning. The Cavelry charged on our rear when we got about 2 miles off taking some prisoners. They also fired shells into us when we got within 4 miles of Centreville killing only a few. One of them struck a rail fence about 10 feet from me and wounding 2 or 3. I was very lucky during the whole of the battle. There was men each side of me got shot dead while I wouldn’t get touched. 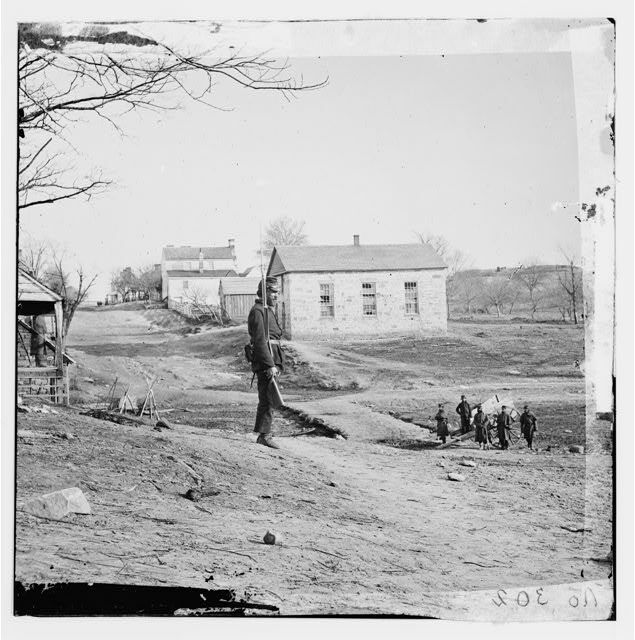 There was hundreds of men walked to the camp at Centreville that were badly wounded about the head and body. There was only 2 of our Company that was wounded that came here with us the rest we had to leave. One is now sitting in front of me, a ball passed right into his mouth and out of his cheek taking several teeth with it. We shall stay here until we get a big enough force to take the place. Nearly all their whole army are there and you can’t see them but when you go up to fire they can pour right into us. I thought I would write to you so you would not feel worried. They told me today that we could not have any letters go but if you get this you write quick and let me know so I can write more. I don’t feel much like writing today. Give my love to all the folks. I have received two letters from you and want to get some more but good bye till I get home. Charles M. Smith was mustered out of the 11th Massachusetts, Company I on June 24, 1864 and promptly reenlisted six month later in the 1st Massachusetts Calvary Battalion. He finally left the Army for good at the end of the War in June, 1865. Charlie settled in Humbolt, Kansas where he married and raised a family. 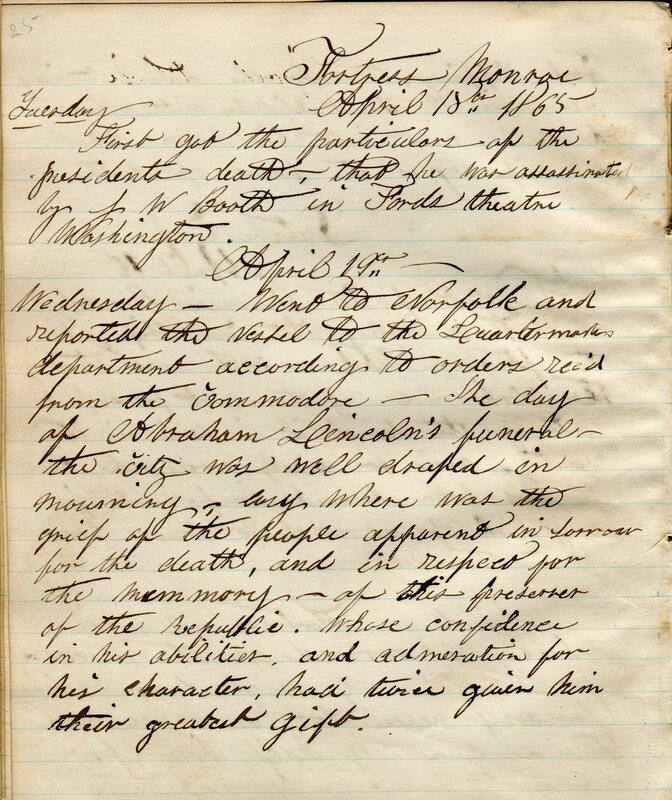 The Drew Archival Library of Duxbury Rural & Historical Society has 8 of his Civil War Letters all of which are as well written and detail laden as the above.